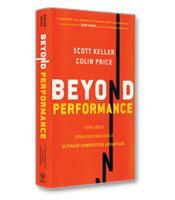 In Beyond Performance, McKinsey & Company's Scott Keller and Colin Price give you everything you need to build an organization that can execute in the short run and has the vitality to prosper over the long term. Drawing on the most exhaustive research effort of its kind on organizational effectiveness and change management, Keller and Price put hard science behind their big idea: that the health of an organization is equally as important as its performance. The secret of achieving and sustaining organizational excellence. Everything you need to build an organization that can execute in the short term and prosper over the long term. Why the health of an organization is equally as important as its performance. How to determine the mutually reinforcing combination of management practices that best fits your organization's context.